Trunks: Ascending to erect, glabrous or puberulent to villous; spines and prickles absent. Leaves: Cauline, alternate, simple; stipules present; petiole .2 to 2 inches; blade deltate to ovate or obovate, .4 to 2.4 inches, base cuneate to cordate, margins 3(-5)-lobed, usually also toothed, surfaces glabrous or nearly so. Flowers: Racemes, ascending to reflexed, 3-15-flowered; pedicels jointed, .08 to .3 inch, glabrous or villous; hypanthium yellow to yellowish green, tubular, .4 to .8 inch, glabrous; sepals 5, yellow, united below, spreading, oblong to elliptic, .12 to .28 inch; petals 5, erect, yellow to red, oblong to obovate; stamens 5, mostly included. Fruit: Berries usually red, orange, brown, or black, spherical, .2 to .4 inch, glabrous; seeds brown to black. Habitat: Wooded slopes, thickets, prairie ravines, bluffs, and fencerows. 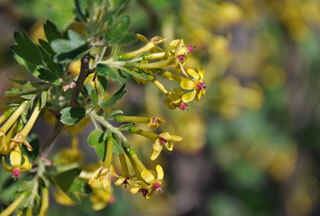 Comments: Ribes aureum is a highly variable species. Kansas plants belong to var. villosum DC.